I have both a love and hate relationship with Target Canada. As many of you have probably heard, since it has been all over social media, Target Canada is closing up shop after just under three years here. I was beyond excited when they announced they were coming here and was among the first of its shoppers. All was well in my little Target-loving world. Then, the news of closing came. Target Canada did a lot of things wrong, I'll admit that. For the life of me, I cannot understand why they did not open a few stores in the bigger cities and test the market first. Instead, they came in full throttle and opened 133 stores. They rushed to open the doors and did it too soon without being even fully stocked. That hurt them even more. Now that is where the store went wrong. It is some of the shoppers that really have me shaking my head. They expected American prices, American goods, etc. They wanted it to be just like the States and it can be similar, but it would never be identical. You're not going to find many places that offer those prices here, you're just not. And to complain that you couldn't find cherry soda? I hear you, it's my jam too. But Target can't change the government laws just for you to get your cherry fix. And then the shoppers who stopped caring about Target completely now wanted to take advantage of the liquidation sales. But those liquidation prices just weren't enough to their liking, so the whining set in again. Here's how liquidation works: starts slow and builds up. They are going to try to get as much money back on the products as they can before they get desperate and price lower. And honestly, I won't sit here and complain about a low discount. It's a discount on something I would have paid full price on, because I try to only buy what I want or need, not just something because it is on sale. I do take issue to Target Canada saying the discounts would be "insane", while probably true in the coming months, it was not true on the day the liquidation started. Target Canada met my expectations. I was able to get my Archer Farms and Market Pantry food items, the One Spot dollar aisle (cutest stationery ever! ), and makeup products like ELF and Sonia Kashuk. I did not have to always cross the border for these things and pay duties at customs. Total win! But I suppose all good things come to an end and it stinks. Just really stinks. Obviously, it's still a sore spot for me. But I will be making another trip or two in the coming months for my final goodbyes to my beloved. Ok, wow, you made it through that essay to the haul (or you scrolled past it, that's fine too)! And hey, maybe you don't agree with me. That's okay! Opinions differ. I stocked up on plenty of food items and random non-exciting bits and bobs not shown. Here's a few of the things I bought! 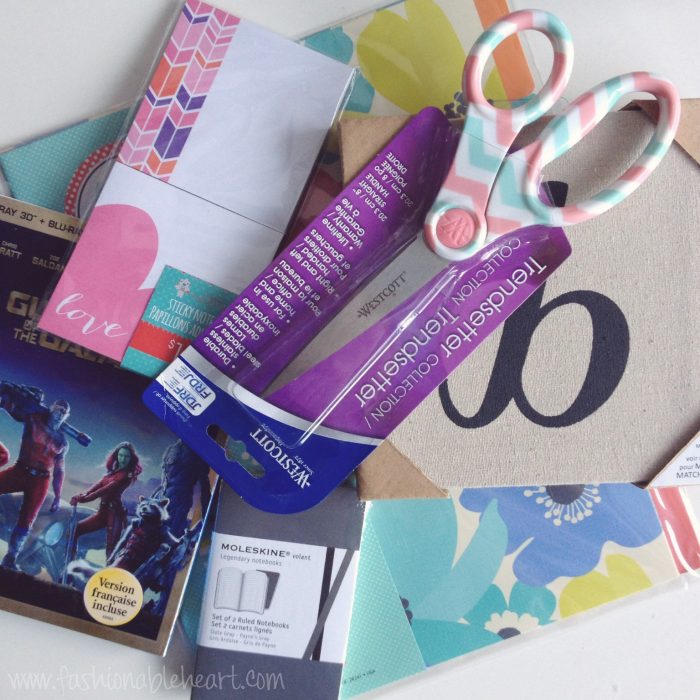 File folders, sticky notes, mini Moleskine notebooks, a monogram "b", pastel scissors, and Guardians of the Galaxy. I'm building my gallery wall up my stairs and the "b" was a perfect addition. Love it! The beauty part of the haul! 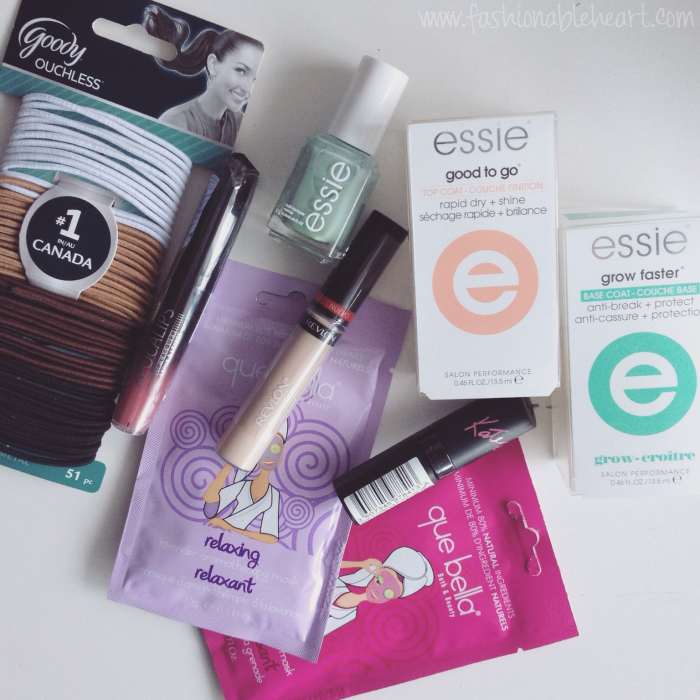 Ouchless hair ties, Apocalips in Celestial, Essie's Turquoise and Caicos, Good to Go top coat, Grow Faster base coat, Kate Moss lipstick, Revlon ColorStay concealer, and two Que Bella masks. I'll be reviewing the two lip products and concealer with swatches soon. Essie's Good to Go is one of my favorite top coats. And I heard about the Que Bella masks from Emilie Clarke on YouTube, so I thought I'd try them! 30% off all of this was an added bonus! Have any of my Canadian readers taken advantage of the liquidation yet? I'd love to hear what you bought! And for all of my fellow American readers, think of me as you shop in my glorious Target. Oh, how I'll miss it. Guess it is back to having to cross the border each time! Way too many! I can't understand how on earth a successful company thought opening nearly all at once was a good idea. And then to open before being fully stocked? Why not push back openings so that you would have items on the shelves? Then, they didn't even offer plus-size clothing because they weren't sure of the market. I'll say they weren't sure of the market! That's why they should have tested it first. Just really dumb to go in blindly with guns blazing! I think they forgot to load those guns! Luckily, the 10% was just on a few things. Most things I saw were 20-30%, but the percentages are growing now. They won't be at full capacity until sometime next month or early April, more than likely. The makeup is going fast! I couldn't even find ELF or NYX, but some Sonia Kashuk was still available. The next time I go, I'll see if they still have the blue mask in stock! It looks like you had a great haul on this trip to Target. Honestly, I get SO mad about this and I feel pretty much exactly the same as you. No store in Canada is EVER exactly the same as it is in the US for so many different reasons. Pricing is always going to be more as well. UGHHHHHH I just wish other Canadians felt the Target love like we do. I like the rationale behind this post, but to be honest, I've always been meh about Target. I don't like Walmart, either. I'm a small town girl, so I know how dangerous box-stores are to local economies. Still, I'm indifferent to see Target go. That being said, I feel bad for all the people who are losing jobs - the market is not a good one. With Smart Set closing its doors, also, there's going to be a lot of Canadians out of work by the end of 2015.